Mermaids Cove is an online gift shop and the virtual presence of a company named "Bon Bini" doing business as Mermaids Cove in beautiful San Diego, California. We currently operate two retail stores. Our primary location is in the "Birthplace of California", the State Historic Park of Old Town. Our other location is in the coastal community of Pacific Beach where it all began in April 2005. Created by Susan Ellsworth, Bon Bini evolved from her heart's desire to celebrate women in art, who, through their creativity, reflect their passion for mermaids and her exotic aquatic friends. 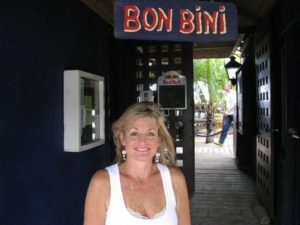 "Bon Bini" means "welcome" in the language of Papiamento, the native tongue of the Dutch Caribbean country, Curacao. This tropical island is nestled among a trio of islands, off the coast of Venezuela, known as the ABC islands with Aruba and Bonair. It was here that our first "mermaid encounter" occurred. After numerous visits, the warm and friendly inhabitants of this delightful island spawned the inspiration for the company's name. Their gracious and relaxed nature is how we like to do business in our stores, with our customers...our friends....and online too! 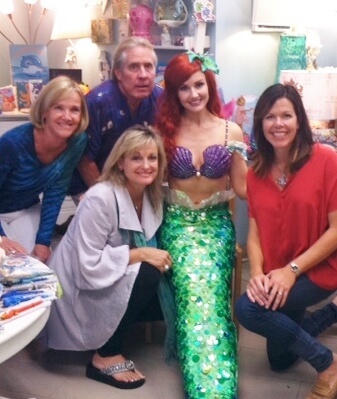 When asked what prompted her to start a business themed around mermaids, she replied without hesitating. "Well...I have always wanted to do something to celebrate women in art, and I have always been intrigued by the beauty and and mystery of the undersea world". Like a bolt from Neptune's trident, it struck her! The MERMAID...what better could kindle this dream! So there you have it.....the company was born. Now then, be sure to click on "OUR STORE" ....enjoy your time exploring, and finally....BON BINI! Thank you for visiting the "COVE".....and.....swim back in again! To find our "COVE" locations on land, click on the "CONTACT" tab in the category bar at the top of our home page. CALL US AT 619-795-1911 SPLASH! !